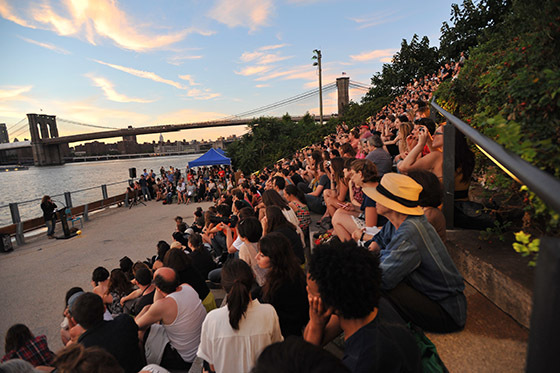 This coming weekend is a big one for events at Brooklyn Bridge Park. On Sunday, the Park will celebrate the 130th anniversary of the completion of the Brooklyn Bridge with a marathon reading of Hart Crane’s epic poem The Bridge at the Granite Prospect on Pier 1 starting at 3:00 p.m. More details here. The 110 foot long schooner Mystic Whaler will be docked at Pier 5 and will welcome visitors from 1:30 to 4:30 p.m. on Saturday and from 1:00 to 4:00 p.m. on Sunday. For nature buffs who are early Sunday risers, there’s a “Blooms and Bugs Tour,” part of NYC Wildflower Week, on Pier 1 starting at 9:00 a.m. More info and RSVP here. Need more of a nature fix? Immediately after “Blooms and Bugs” you can walk over to the Park’s Main Street section in DUMBO for “Seining the River Wild.” More info and RSVP here. Want to sharpen your urban bike riding skills? Bike New York will have a street skills ride starting at Pier 5 at 10:00 a.m. and going until 3:00 p.m. Register and more info here. Hungry? Don’t forget Smorgasburg. The Promenade Gardeners are having a “More Than a Bake Sale” Saturday on the Promenade near the Montague Street entrance, starting at 9:30 a.m. The sale will feature “pleasures from the kitchen, treasures from the parlor, gems from the bookshelves of a private library of gardening books.” All proceeds will go to the Promenade Garden Conservancy’s Plant Fund. Bargemusic has three “Masterworks” concerts scheduled. On Friday evening at 8:00 there are works by Ravel, Carter, Janacek, Ligeti, Kurtag, and Schubert performed on violin and piano. Saturday evening’s 8:00 concert features works by Boccherini, Schubert, Chopin, and Franck on cello and piano. On Sunday afternoon at 2:00 the Fine Arts Quartet will perform works by Haydn, Saint-Saens, and Efrem Zimbalist. On Saturday afternoon at 3:00 (doors open at 2:30) there will be a free, family-oriented Music in Motion concert. More information and buy tix here. The Brooklyn Heights Cinema will be showing The Iceman, starring Michael Shannon as Richard Kuklinski, a contract killer who made over 100 “hits,” and Winona Ryder as his wife. The Cinema is also showing Mud. Showtimes are here. Don’t forget the Willowtown Spring Fair on Saturday, Theater 2020’s A Midsummer Night’s Dream opening this weekend, the Heights Players’ A Chorus Line continuing its run, the Art of Brooklyn Film Festival, and the Sacred Sites tours. This weekend presents a wealth of opportunities for entertainment and learning. If I’ve left anything out, please let me know with a comment below. Fourth paragraph in, Michael Shannon should not have an / in his name. Not sure how that happened, but good catch; thanks. I’ve made the correction.